The vinyl arrived and the install went pretty good. The problem with wrapping with vinyl is that it cannot stretch and shrink to the console in one piece. I used a professional on the dash for this reason, they have the ability to cut and sew to make it work. 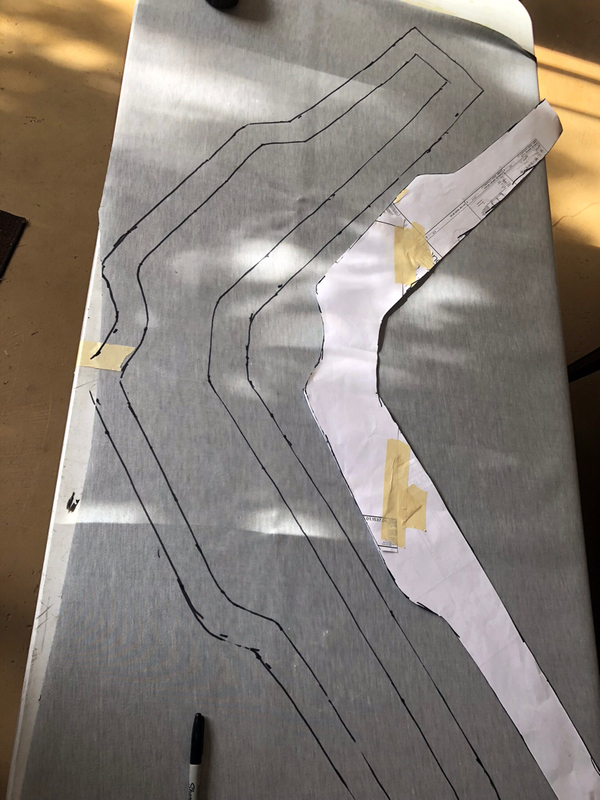 And I think on the dash the way we choose the stitching and seam locations add to the look of the dash. For the console I thought adding the stitching would compete with the dash, plus I had an idea and wanted to try myself. My idea was to cut a slit in the console at the required locations where the vinyl would not be able to stretch or shrink. On this console the locations are small. 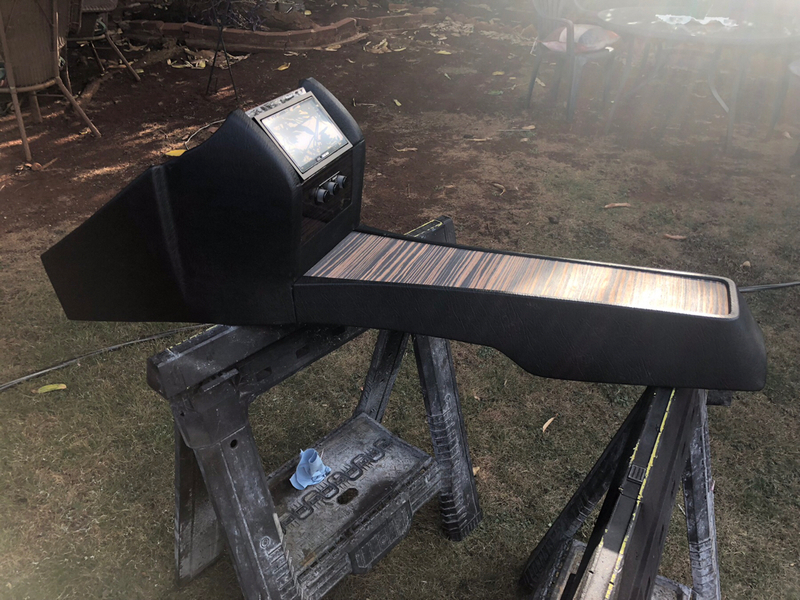 One on each side of the console in line with where the upper meets the lower, and on each side of the bend just at the bottom of the radio. After a practice run on scrap I could see it would work, where each side of the cut of vinyl would tuck into the slit in the body. 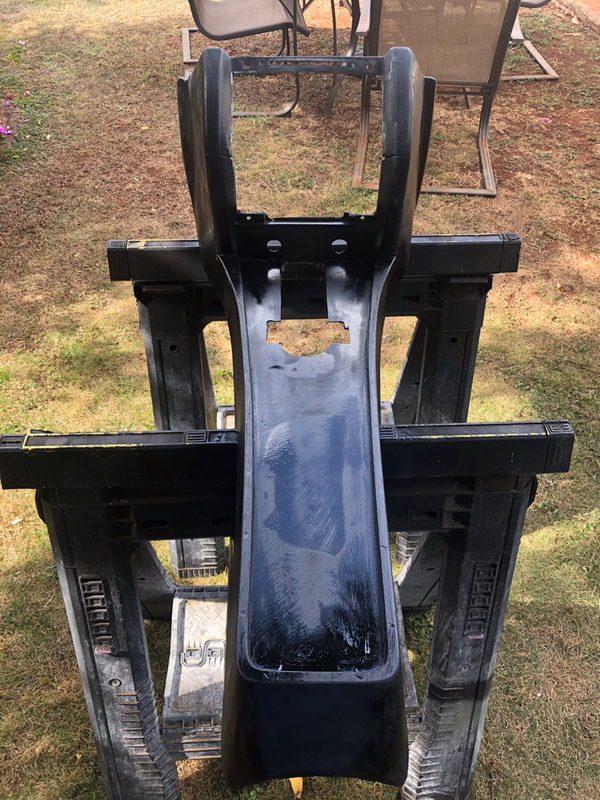 After finish sanding the Bondo I painted black to seal it. If you look close you can see the little slits below where the radio goes. Then I made a template from paper that laid flat with the surface and traced out. The vinyl has a little bit of flex, but starting requiring none makes it much easier. This template is for the lower rear portion. 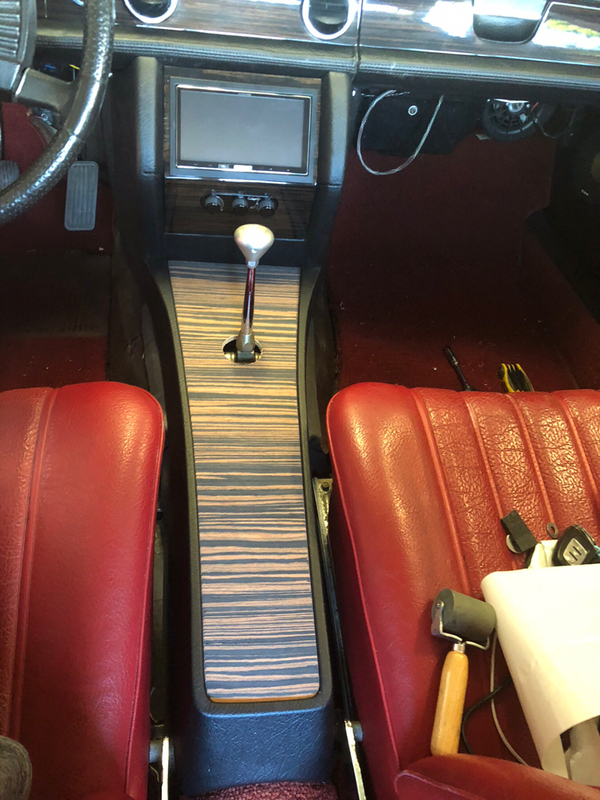 The wood needs to be finished, cup holder installed, and I’m using a factory shift boot. I think overall it looks pretty stock and good. The seams on the sides look good and not out of place. I’m not as happy with the look of the seams by the radio. But the only other choices would be to have a professional either vacuum install the vinyl or add stitching. Both have their downsides too. It took less than 2 yards of vinyl at a cost of about $100. So pretty happy with the result. Going to take a whole day to finish the wood on the insert yet. That is a great looking console. Following your project is way easier and more fun than tackling mine! Great job. That looks amazing! Looking great! I love the way it's retro and modern at the same time. Classy! Really fantastic work. I ended up reading the whole thing just to find out about the steering. I've have some Motorsports experience from being young and building some karts. I've been doing a lot of research the last couple years on suspension and steering geometry for my drift car and planned engine swapps. It was interesting to see you went exactly with the cavalier rack idea I had and dismissed after tire clearance looked sketchy. As you were doing the arm trim originally,I was reading like"noooo, that's gonna make ackerman completely zeroed out. I am reducing my ackerman and increasing angle (good for drifting) by shortening the arms similar to your original effort but not as extreme. I love the final steering setup execution. Which rack did you end up with finally? 300decel, 3doghouse, Tomguy thanks for the positive comments and posting, somehow I missed the notifications. rwd4ever, I am using the Flaming River rear steer power rack. I have been driving the car now as a daily driver. Don’t drive far to work, only about 10 miles each way. But now have about 1100 miles. Been making a list of things to change. Steering geometry feels good, turning radius is good. Issue 1 is too much power from the pump. I am using the gm stock pump, with shims to lower pressure/flow. Still too much, going to switch to the Flaming River pump. Issue 2. I’m also getting too much input into the steering from the road. Stock this car had a steering stabilizer, I have yet to figure out a way to add one, just no room. Even though the total weight of the car only increased a little over 100lbs with the the swap, the front end still feels too heavy. I’m not happy with how the transmission shifts from 1st to 2nd, and with the gearing in the rear end the engine is spinning about 2500rpms at highway speeds. The car looks great, I get asked about it almost every day, but driving it doesn’t match the looks, at least in comfort. Power is crazy, going to kill me! On the highway the engine just begs for more right foot! I’m sure I’ve surprised a few fellow motorists with the acceleration. So in the planning stages now for changes. First up is a diet. Going to build another engine starting with an LS2 aluminum block. Most everything will swap over but the pistons. That will save about 100lbs. I will loose a little power, but have way too much anyway. Second will be to switch to a 4L65e or 4L70e transmission. This will save another 100lbs or so. This will also make the car feel a little lighter as it will have a better 1st to 2nd shift and a little better gearing for highway speeds. 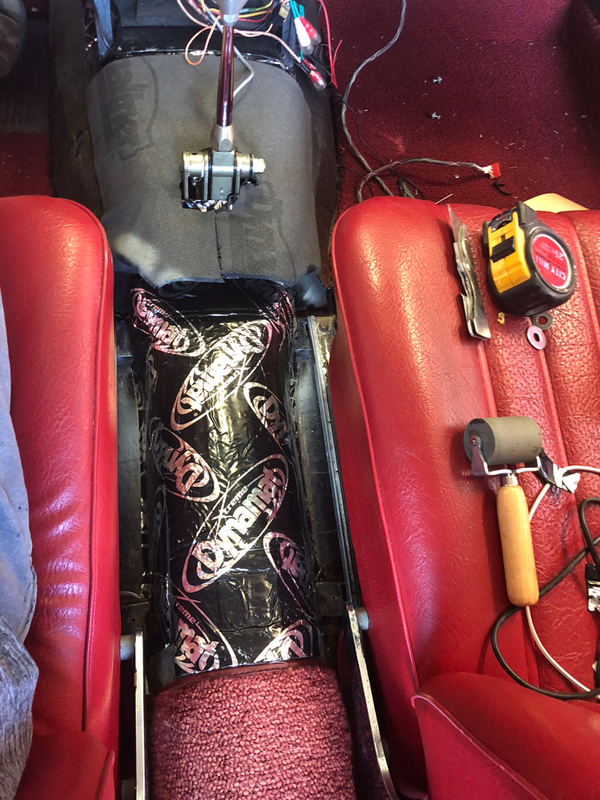 While I have the engine/trans out I will also be stiffening up the rack and pinion mount and frame connection, maybe rebuild the engine crossmember to make some room for the steering stabilizer. Hopefully this will firm up the overall steering feel and minimize road input. I’m also getting a little too much vibration from the engine to the car, so going to swap to different mounts. This will be about a $4k endeavor I’m estimating. These changes should get me under stock weight too! On the interior the dash, gauges, stereo, AC, push button start, automatic headlights, backup camera, console, trans shifter and location, intermittent wipers, etc are all winners. 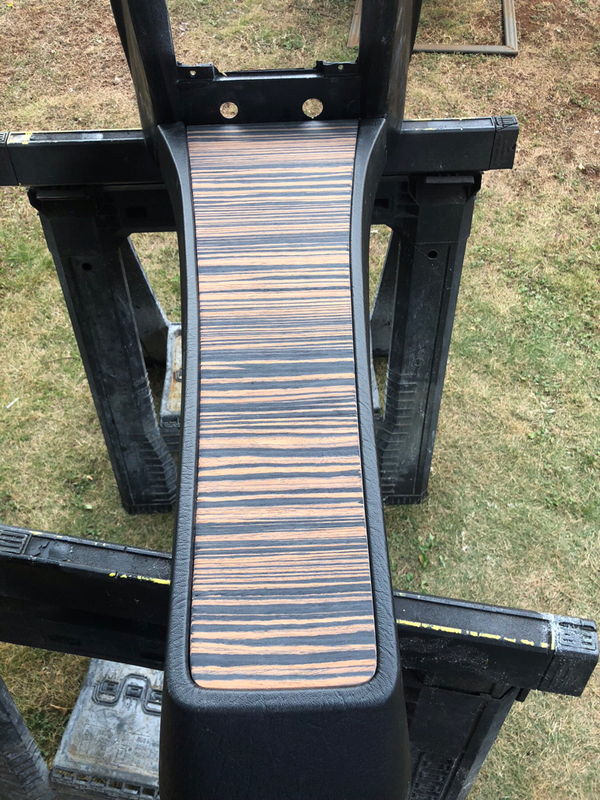 The factory seating vinyl is in almost perfect shape, but the padding needs to be updated to get some of the height back from sagging. This may be a better answer to your pressure issue and being adjustable is always nice. You could try adding some castor to the front end to reduce twitchyness also. That could add to your heavy feel too though. Is it possible you have too way much castor in the front end to compensate the twitchyness and it's still way over powered causing a heavy feel and twitchyness?